May 4, 2016 – Thermacore, Inc. has delivered a high-power heat stop for the 41.5-meter tall Daniel K. Inouye Solar Telescope (DKIST), located atop the Haleakalā volcano on the Hawaiian island of Maui. A heat stop is an integral part of the design of solar telescopes, and represents one of its larger engineering challenges. Located at the prime focus, the heat stop prevents unwanted solar disc light from heating and scattering on subsequent optics. In a solar telescope such as the DKIST, in addition to blocking light, the heat stop must also dissipate huge amounts of thermal energy. For the DKIST, the heat stop reduces the heat load on subsequent optics from an enormous 12 kilowatts to a minuscule 300 watts (a reduction factor of 40). Designed by Thermacore, the heat stop assembly is actively cooled by an internal system of porous layer heat exchangers that dissipate approximately 11 kilowatts at peak operating load. The heat stop must not only be able to survive this heat load, but it also must remain cool enough not to induce any additional turbulence inside the telescope’s dome. As part of the design process, Thermacore was required to demonstrate the efficacy and robustness of its heat stop cooling system across the full range of potential operating conditions, as well as in some “failure mode” scenarios in which the failure of some other component had resulted in the telescope being aligned outside of its design range. Once operational, the DKIST will be able to provide the sharpest views ever taken of the solar surface, which will allow scientists to learn even more about the sun and solar-terrestrial interactions. The DKIST will allow astronomers to resolve the extremely small, violently active, magnetic fields that control the temperature of the corona and the solar wind that produce flares and x-ray emissions, and help to improve prediction of the way these “space weather” phenomena influence the earth. Construction at the DKIST site began in January 2013. Work on the telescope’s housing was completed in September of that year. 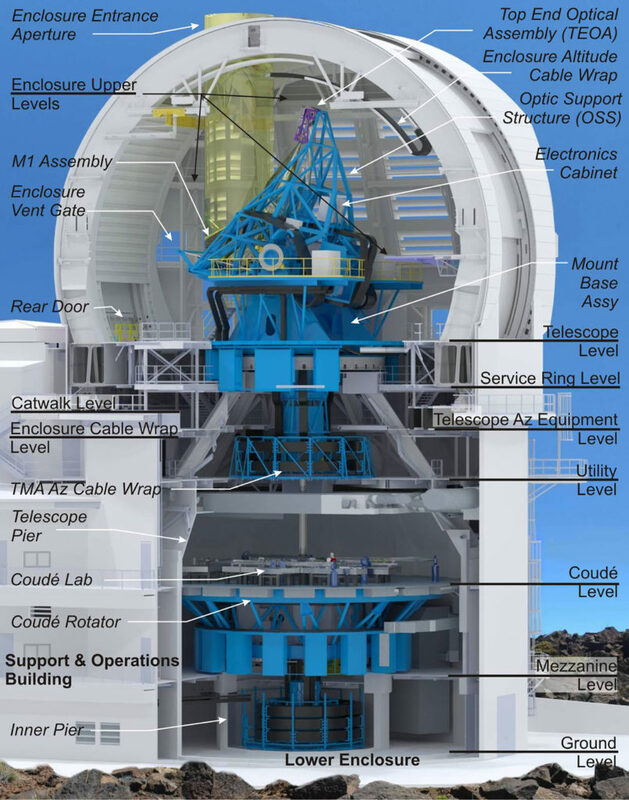 The High Altitude Observatory (HAO) in Boulder, Colorado is building the Visible Spectro-Polarimeter (ViSP), one of four first light instruments being developed for DKIST. The ViSP instrument will be able to simultaneously measure three distinct solar emission lines at a very high spectral resolution. DKIST is funded by the National Science Foundation. The project is managed by the Association of Universities for Research in Astronomy and the National Solar Observatory. DKIST represents a collaboration of 22 institutions from across the solar physics community, including, the High Altitude Observatory, the New Jersey Institute of Technology, the University of Hawaii for Astronomy, and the University of Chicago Department of Astronomy and Astrophysics. International instrument partners include Germany and the United Kingdom.